"What attracted me to the software was the flexibility of the different media that could be used". UK electronics company. 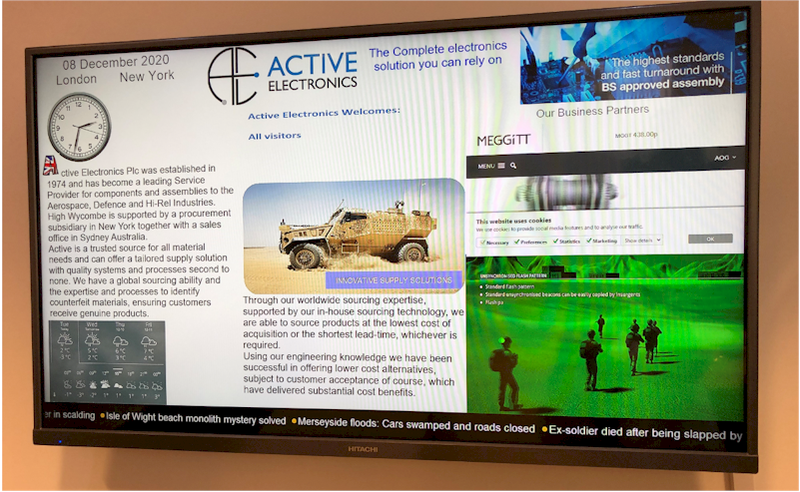 Active Electronics is a small company of 38 people, established since 1974, supplying electronic components and assemblies to the Aerospace, Defence and High Reliability industries. They have a number of customers and suppliers visiting their premises. "As such, I had been tasked with updating our reception area with new chairs and reception desk. We also had a TV (Monitor) running a PowerPoint programme showing visitors names. I felt that we could use the TV to show more than visitor's names, so did some research on the Internet where I came across Repeat Software". Nigel Luker, Kitting and Assembly Manager for Active Electronics. "What attracted me to Repeat Signage software was the flexibility of the different media that could be used, the ease of building a presentation package. The online tutorials help me build the basics giving a dynamic moving display, I quickly added more complex graphics." "The other big benefit was to do this without committing any money, I was then able to give a live demonstration to senior management without compromise. The approval to spend the money was instant. I worked from our brochure giving, I think a moving brochure display, showing visitors an insight into our business activities . I now added the weather, Flash videos and News feed running along the bottom. The display is over 100M, with a complexity index of 54 and using 21 controls, which is pushing Repeat Signage to its limits, but still works perfectly. Repeat Signage is professional, user-friendly digital signage software that allows you to promote your products and services to your audience using a variety of flexible media, with touch screen support, local and remote updating of content over the Internet. Please click here for Repeat Signage comparisons and the variety of media you can include your presentations.